There is an old tradition in England that sport and politics do not mix. This carried over into FIFA when it was established in 1904, sought to take control of the Olympic soccer competition and then organized its own professional World Cup. Yet, as Bill Murray, my co-author on The History of Soccer in Australia: A Tale of Two Halves, has pointed out, it was the British home nations (England, Ireland, Scotland and Wales) who brought politics into soccer when they refused to play Germany, Austria and Hungary in the aftermath of the first world war. They expected everyone in FIFA to follow suit, and when this didn't happen, they temporarily withdrew from the organization. Since then, politics have regularly intruded into the soccer world, including recently with the controversial selections of Russia and Qatar to host the next two World Cups. As one of the most politically charged World Cups gets set to kick off in Moscow today, we look back at five other moments in history when politics did mix with soccer internationally. In the 1930s, Italian dictator Benito Mussolini discovered that the game had a greater pull on his subjects than his fascist ideology. After Uruguay hosted and won the first World Cup in 1930, Mussolini was determined that Italy would do the same four years later. He did everything in his power to make this happen, too. Argentina was denuded of star players who were "persuaded" to play for Italy, while Italy's own players were threatened with immediate conscription into the army if they failed to win. Il Duce may or may not have entertained match officials on occasion, but the tournament had some very strange refereeing decisions that reinforced Italy's "home ground advantage." The 1934 tournament was so contentious, in fact, the UEFA website's story of the event is entitled "1934: Mussolini Pulls The Levers. Mussolini got his victory, albeit a tainted one. 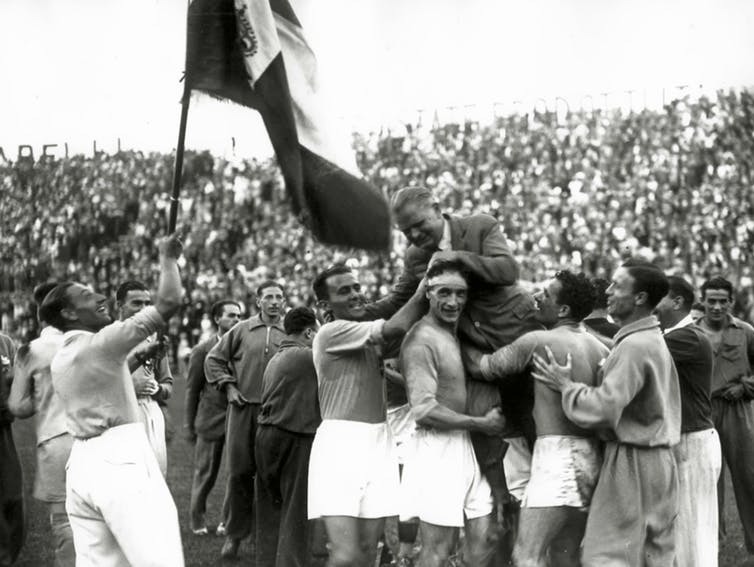 Italy repeated its victory in 1938 in France with a much stronger team. But even here, political pressure was not absent. According to one popular story, the Italian players received a message before the final against Hungary: "Win or die." At the height of the Cold War in the 1950s and '60s, the Soviet Union was determined to make its mark through the game as well. Winning a World Cup against full-time professionals was beyond their capacity at the time, so the Soviets set their sights a bit lower: the nominally amateur Olympic Games. 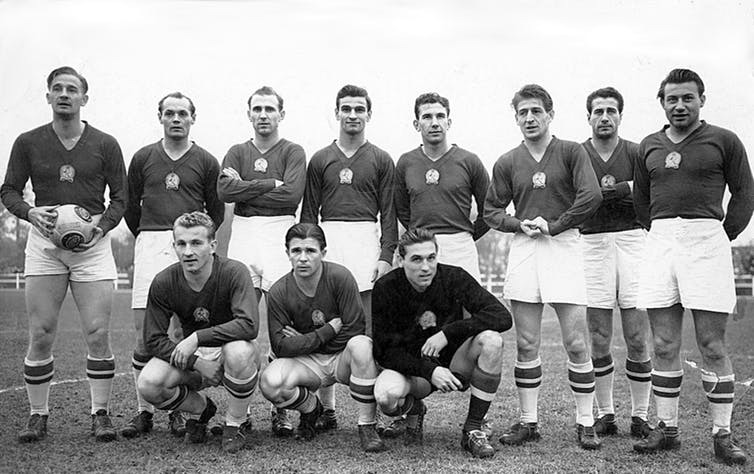 They came up short at the Helsinki Games in 1952, however, when Yugoslavia knocked them out and Hungary's "Golden Team" won the tournament. The Soviets were determined not to fail again. At the next Olympics in Melbourne in 1956, the Hungarians were conspicuously absent. There is strong circumstantial evidence that the Soviet Union pressured the dominant Hungarian team to stay home, clearing the way for it to win gold. The Soviets did just that, getting revenge on Yugoslavia in the final. In the lead-up to the World Cup in West Germany in 1974, a playoff was held between the Soviet Union and Chile for the last qualifying spot. Just before the first leg of the playoff, the leftist government of Salvador Allende was overthrown in Chile in a bloody coup by a junta led by Augusto Pinochet. The first match went ahead in Moscow and resulted in a scoreless draw, giving Chile a small advantage. If the Chileans could win the second leg at home, they would go to West Germany. The second match was never played. Following the coup, thousands of Allende supporters were rounded up and taken to Estadio Nacional in Santiago, where they were imprisoned and tortured. According to official estimates, 41 people were killed. FIFA is said to have inspected the stadium and deemed it fit to stage the match, despite the fact many of the prisoners were still being held there. However, the Soviets refused to play out of respect for the dead. The Chilean team took to the field and walked the ball into the net for the victory and one of the most shameful qualifications in World Cup history. In 1978, the World Cup returned to Argentina, where another rapacious military junta was in control. The most controversial moment on the pitch also had a political element to it. In a critical match, the hosts routed Peru by an inexplicable 6-0 to leapfrog mighty Brazil and clinch their spot in the final. The final group matches were supposed to have been played at exactly the same time, but Argentina had managed to delay its match so the team knew exactly what it had to do to progress. It later emerged there was a deal between the juntas in the two countries to fix the match. In 2012, former Peruvian Senator Genaro Ledesma said that Argentine dictator Jorge Videla had agreed to accept 13 Peruvian political prisoners in return for ensuring the hosts progressed to the final at the expense of Brazil. Argentina ended up beating the Netherlands in the final to become the fifth host to win the World Cup at home. While political interference affected the results of matches and tournaments in FIFA's early days, the greatest political scandals in recent times have occurred over the bidding to host the World Cup. The executive committee was expected to be deadlocked at 12-all when it voted in Zurich, with Blatter then casting the deciding vote in favor of South Africa. But Charles Dempsey, the president of the New Zealand Federation, mysteriously disappeared before the vote took place, giving Germany a shock 12-11 victory. In his book, The Dirty Game: Uncovering the Scandal at FIFA, the investigative journalist Andrew Jennings revealed Dempsey had been paid $250,000 to change his vote. Dempsey later claimed that he had been under intolerable pressure from both German Chancellor Gerhard Schroeder and South African President Nelson Mandela and had been a "nervous wreck." His non-vote ended up sending the World Cup to Germany, but Blatter got his prized South Africa World Cup four years later. Just not the Nobel Prize. So, politics has always been part of the World Cup - sometimes overtly, more often covertly - and yet FIFA still insists that there shall be no political interference in the game under its auspices. Those who misinterpret this notion can find their country suspended from competition, but the FIFA ship will sail on. Until, that is, it runs into the United States tax authorities, just like Al Capone. Roy Hay is an Honorary Fellow at Deakin University. This post was originally published on The Conversation.